A fun appetizer for summer parties, Shabbat dinners, game-nights or kids' birthday parties. Its officially hot dog season if ever there was one, and I freely admit: I love hot dogs. I have even found a way to combine a love of hot dogs with a love of challah with my famous challah dogs. 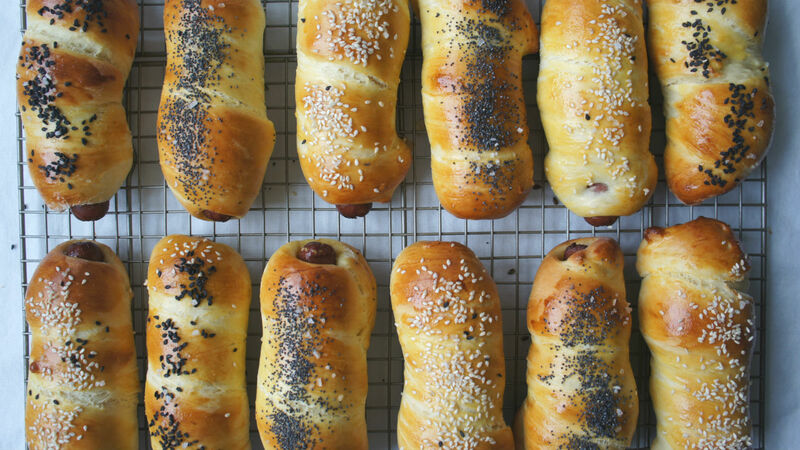 What are challah dogs you might be wondering? Well it’s my answer to the bagel dog, or the pretzel dog. And one of the great things about this recipe is you can use any challah recipe you prefer. The key is rolling your challah into roughly 3 oz size pieces and then snaking it around the hot dogs. I brush them simply with a beaten egg before adding toppings. And the challah dogs are all about fun toppings. I like making an “everything bagel” topping by combining 1 Tbsp sesame seeds, 1 Tbsp poppy seeds, 1 Tbsp dried garlic (whole pieces, not garlic powder), 1 Tbsp dried onion (whole pieces, not onion powder) and 1/2 Tbsp thick sea salt and then sprinkling it on top. You can also top with poppy seeds, black sesame seeds or even caraway seeds. These are such a fun appetizer for your summer parties, Shabbat dinners, game-watching nights or even kids’ birthday parties. Make a big batch and don’t count on leftovers. Can you make them and reheat them? Yes actually you can. They are always better immediately out of the oven, but I have also served them several hours later either reheated or at room temperature. In a small bowl, place yeast, 1 tsp sugar and lukewarm water. Allow to sit around 10 minutes, until it becomes foamy on top. In a large bowl or stand mixer fitted with the whisk attachment, mix together 1 ½ cups flour, salt and sugar. After the water-yeast mixture has become foamy, add to flour mixture along with oil. Mix thoroughly. Add another 1 cup of flour and eggs and mix until smooth. Switch to the dough hook attachment if you are using a stand mixer. Add another 1 ½- 2 cups of flour, mixing thoroughly and then remove from bowl and place on a floured surface. Knead remaining ½ cup flour into dough, continuing to knead for around 5 minutes (or however long your hands will last). Place dough in a greased bowl and cover with damp towel. Allow to rise at least around 3 hours, punching down at least once if possible. After dough has risen, start cutting it into 3 oz pieces (I like using a small digital scale for this task). Wrap dough around each hot dog, pinching ends under and placing on a baking sheet lined with parchment paper or slipat baking mats. Whisk 1 egg with 1 tsp water and brush each challah dog with egg wash. Top with sesame seeds poppy seeds, black sesame seeds, thick sea salt or caraway seeds if desired. Bake for 18 minutes, or until puffy and golden all over. Pronounced: KHAH-luh, Origin: Hebrew, ceremonial bread eaten on Shabbat and Jewish holidays. It should come as no surprise that challah wrapped around some brie is delicious, decadent and a great party appetizer. What's better than challah? Chocolate chip challah laced with chocolate chips, cinnamon, vanilla and dark cocoa powder. Deli meats slathered in Russian dressing and wrapped in puff pastry -- now just a touch fancier.